If you have been poking around this web site and reading any of these image descriptions you will probably have recognized that this is one of my favorite wedding venues anywhere. In fact it is probably one of the most desirable wedding locations anywhere in the world. This is none other than the grand entry stairways at Oheka Castle on Long Island, NY. This spectacular property has been featured in more movies, television shows, music videos and commercial photography shoots than I could possibly list here. It has been used as an entertainment venue by celebrities worldwide which is the reason I’m not even showing you a bride and groom posed on this magnificent entry stairway. Part of my contract with the celebrity wedding couple prohibits me from publicly displaying any of their images, but I couldn’t resist showing you how they decorated for their extravagant event. What a wonderful spot for pictures of the bride and groom and their bridal party attendants. This is just the entry way. Upstairs you will find the huge formal dining room which is used for the cocktail hour and indoor wedding ceremony, if weather doesn’t permit outdoor activities. There is also the main ballroom and library on the next level...elegant backdrops for wedding photographs and for hosting the most extravagant of wedding celebrations. Outdoors there is a huge cobblestone courtyard which you enter through a stone arch, a tremendous reflecting pool, tree-lined paths, boxwood gardens and panoramic views in every direction as this famous mansion was built on the highest point on Long Island, New York. 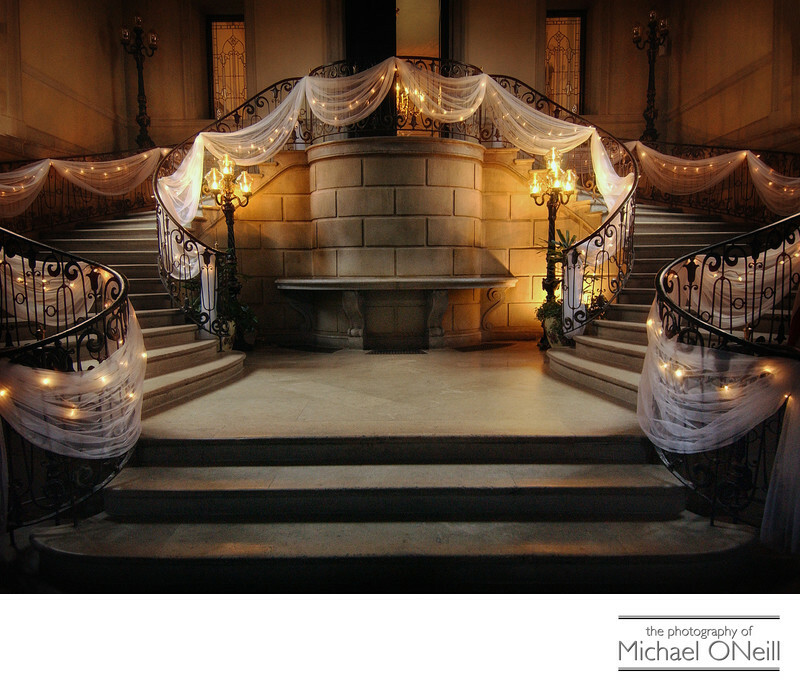 I love creating award-winning photographs in and about Oheka Castle. If you are planning a wedding here give me a call. My studio and gallery are located just 15 minutes east of the castle and I welcome the opportunity to discuss your plans and wishes for your wedding day.